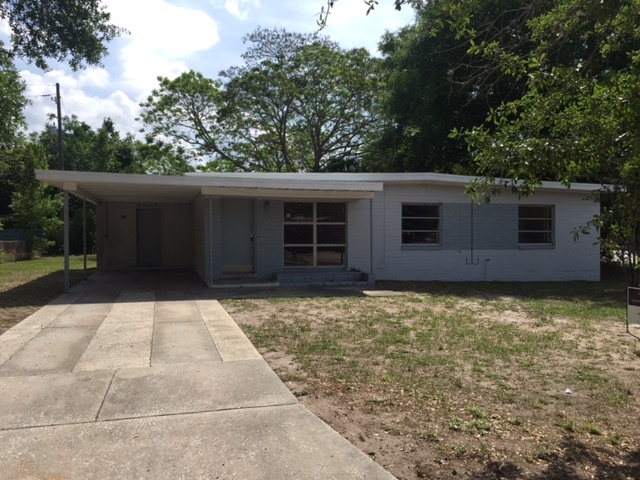 Drop Dead Gorgeous 3 bedroom 2 bath COMPLETELY RENOVATED Winter Park home is just a stone’s throw from Park Ave, Downtown Orlando, Rollins College, and Florida Hospital. As you enter this fabulous home you notice the quality throughout. BRAND NEW Italian porcelain wood tiles run throughout the home. The living space is truly without comparison with the living room, kitchen and dining room open to each other creating the perfect entertaining space. BRAND NEW windows installed throughout the home provide ample natural bright light, while also featuring recessed lighting throughout sure to bright up your evenings. The designer kitchen features BRAND NEW stainless steel LG appliances, BRAND NEW all wood white shaker cabinets with White Ice granite countertops that have a unique Leather Finish that you will just love to touch. The beautiful over sized master suite is complete with large walk-in closet and gorgeous master bathroom with dual-vanity sink with leather finished granite countertops, and a breath-taking waterfall shower design. All major systems to your new home have been replaced and upgraded; BRAND NEW shingle roof, BRAND NEW High efficiency (14.5 seer) HVAC, Upgraded Electrical Throughout meeting all of Winter Park new codes, Upgraded Plumbing the both bathrooms and kitchen & BRAND NEW Water Heater. The backyard once an eyesore has been transformed with a BRAND NEW paver patio, a BRAND NEW Fully Fenced yard, and the entire lot contains NEW, FRESH sod that will thrive with your 5-zone automatic sprinkler system The property also features a BRAND NEW Paver Driveway, Walkway, a BRAND NEW garage door. This home has been completely redesigned from top to bottom, BRAND NEW EVERYTHING. Don’t miss out on this fantastic opportunity, for once you view this property, the only question will that will remain is how soon will you be enjoying this home that you now want.